"I want to be a midwife when I grow up." I was just a little girl when I said that. I have vivid memories of watching in fascination as the midwife tended to my mother while giving birth to my siblings, thinking she was the coolest person ever. Old family photo of me, 6 years old, at the birth of one of my siblings. While I don't plan to pursue midwifery until later in life, I very much love being a doula right now and feel that it's always been my destiny, so to speak. I didn't just decide on a whim one day to become a doula because I thought births were awesome (they are). I grew up with birth as a normal part of life and started cleaning and babysitting for postpartum women when I was still a teenager. When I grew up, got married and became pregnant, there was no fear or anxiety in me regarding childbirth. How many times had I seen my mother calmly bear children with her family supporting her? I'd just do the same thing. 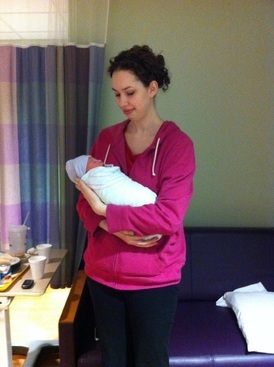 I had a midwife- and doula-supported birth and it was an empowering, influential experience. I felt like my choices and desires were respected, not just tolerated. I felt like my birth team believed in me. My belief in the importance of women supporting women through the most significant times in their lives became so much more real. I soon started realizing that not all of my peers were having the same experience. Some of them felt like nobody listened to their concerns or treated them like an individual. Some of them felt like they weren't given all the information they needed to make choices. I became a doula and felt like I was slipping into a comfortable old pair of shoes. Being by a woman's side as she becomes a mother is amazing. I tear up every time we hear that first cry! Maybe I'm the only person in the room who believes in you no matter what. Maybe I'm the only one telling you the truth about your strength. Maybe I'm the only person who respects and supports your choices, whatever they may be. When I'm your doula I'm on your side. Fast forward to holding my first "doula baby".